An alternative currency, created to keep small companies afloat during the 1930s recession, is still thriving as it marks its 75th anniversary milestone. The current economic downturn reveals that the "WIR" credit system has evolved over the decades into a means of attracting new business as opposed to counteracting money supply shortages. WIR was launched in Zurich in October 1934 as thousands of small and medium-sized enterprises (SMEs) struggled to cope with the consequences of the great global depression. Cash was hard to come by as stock markets crashed, banks collapsed and people with money hoarded their reserves. The term WIR derived from the word "wirtschaftsring", or "economic circle". Wir is also the German word for "we", signifying togetherness and solidarity. SMEs subscribed to the organised bartering system – backed by an unofficial form of currency – to enable them to trade with one another in the absence of real cash. 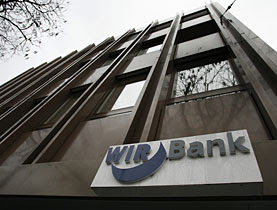 The system was such a success that it quickly spread throughout Switzerland and the WIR Bank was given an official licence from the national authorities. The bank was authorised to grant WIR loans, initially backed by such collateral as building deeds, but later by cash deposits from members. Because the bank does not pay interest on WIR deposits, it can supply this line of credit at very low interest rates. WIR Bank spokesman Michael Schnebli told swissinfo.ch that WIR has a stabilising effect on the normal monetary system by providing a complementary source of funding when liquidity dries up. "By granting WIR credits we increase the amount of real money in the system because it frees up cash," he said. "Other countries also operate bartering systems, but our system is unique because we can issue loans." The role and usage of WIR has also changed over time. SMEs advertise their willingness to accept the alternative currency as part payment for goods and services to give them the edge over other competition. In this way, smaller suppliers can attract more business over larger companies that can provide goods cheaper, but want 100 per cent cash payment. Some 60,000 SMEs participate in the WIR network. "We get additional business from other small traders by using WIR," Karl Frei, owner of furniture making firm Freba and picture framing company Haus Zum Rahmen, told swissinfo.ch. "We can use it to have our vehicles maintained at a garage and they can buy furniture from us." Companies engage in a strategic game of WIR "placement", according to Frei. WIR "currency" has no value outside of the restricted business circle and attracts no interest if it is deposited at the WIR Bank, so it is in the interest of firms to keep it circulating to avoid having too much on their hands. Some companies, therefore, have a rather double-sided view of WIR – it is good to attract new business and to spend, but it does not add value to their accounts. "People who don't use it often think we are crazy. WIR is appreciated but not loved by everyone," said Frei. WIR Bank has constantly expanded to offer a full range of retail banking services, such as mortgage loans and savings accounts. It also now offers cash savings accounts and loans to complement its WIR business. "We have to remain innovative to keep WIR competitive, but it has worked well in the past 75 years," said Schebli. "I see no reason why it cannot keep going for at the least the same period in the future.